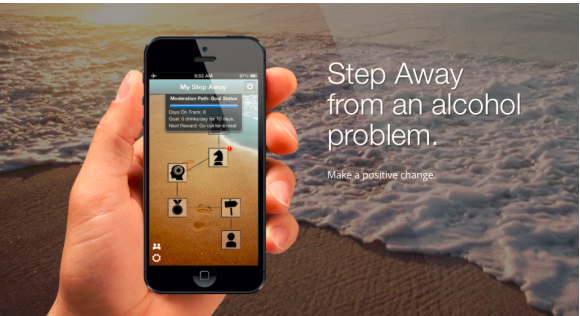 Step Away is a mobile app aimed at helping users to change their drinking habits. When entering the program, a video tutorial gives users a clear explanation about how the program should be used. Users are then asked to complete a short screening questionnaire to establish their drinking profile and are given feedback about their risk level. The program leads users to set a goal: either to moderate their drinking or to abstain from drinking for a set number of days. The program is designed as a sequence of steps. The developers recommend completing one step each day and using the app over a period of three months. Steps include choosing how to reward a goal accomplished, information and tips about dealing with cravings, coping strategies, etc. The program also features a daily goal tracker, which is summarized in a weekly report that describes the user’s state in relation to his or her goals. An additional feature is a “Help” button that offers coping tools in times of need (e.g. having a craving, feeling stressed, etc.). Step Away is a program that is most suitable for users who are dealing with mild to moderate problems with alcohol. The app is informative and provides good-quality content. The assessments and feedback contribute to maintaining users’ motivation to complete the program. On the downside, although the developers recommend completing the program in three months, there is no limitation on content availability. For example, the recommendation to do one step a day could be missed and the user could easily complete the steps in one day. Furthermore, the program lacks some motivational features that could inspire users toward goal achievement. Step Away could be a suitable supplement to treatment for patients dealing with problem drinking. The program can supplement some of the informational aspects of the treatment and assist with tracking the patient’s progress.